With all this stuff lined up neatly on your workspace we’re ready to get started! First inspect the board and plan your work. The build order on the previous page is just a guide so you might want to change it fit your way of building. For those of you who’d like to speed build this without checking things while building I can recommend stuffing all the resistors first, then caps (first monoblocks and then electrolytics) and finish it up with the semiconductors and integrated circuits, you should be able to finish the whole project in perhaps <10h if you don’t mess it up. But for the rest of you who’d like to take it nice and slow I can recommend the scenic route – Stick with the build order and test everything once you finished a section. If you’ve bought sockets and are thinking about socketing all the LM301, it might be a good idea to start with those first, before stuffing anything else. 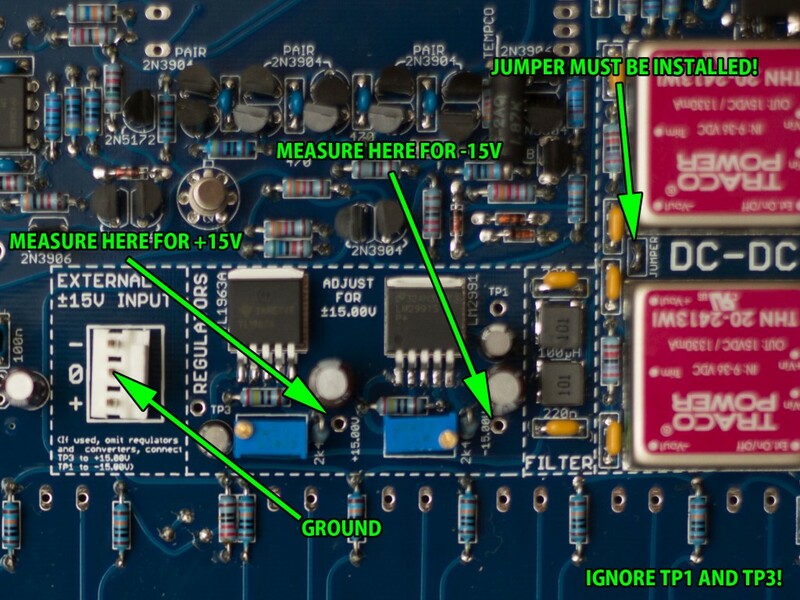 If you didn’t get a DC-DC converter it’s assumed you have a PSU of your own and you can then skip this part of the preparation. Though this approach is unsupported, and you’ll have to figure out how to handle the power to the amps on your own. The onboard DC-DC converter takes a wall-wart DC source and converts it to +/-15V for our synth, very neat since no-one has to handle mains voltage and other dangerous stuff. The converter is also short circuit protected, which is great since it reduces the risk of frying stuff if you plug it in backwards. You’ll find the PSU area in the middle of the board. So install all parts where they’re marked on the board and you should have something that looks like this. Measure between ground and +15.00V pad and adjust trimmer for +15.00V. Then do the same for the -15.00V pad. The TP1 and TP3 pads can be ignored if you’re not using the external input. 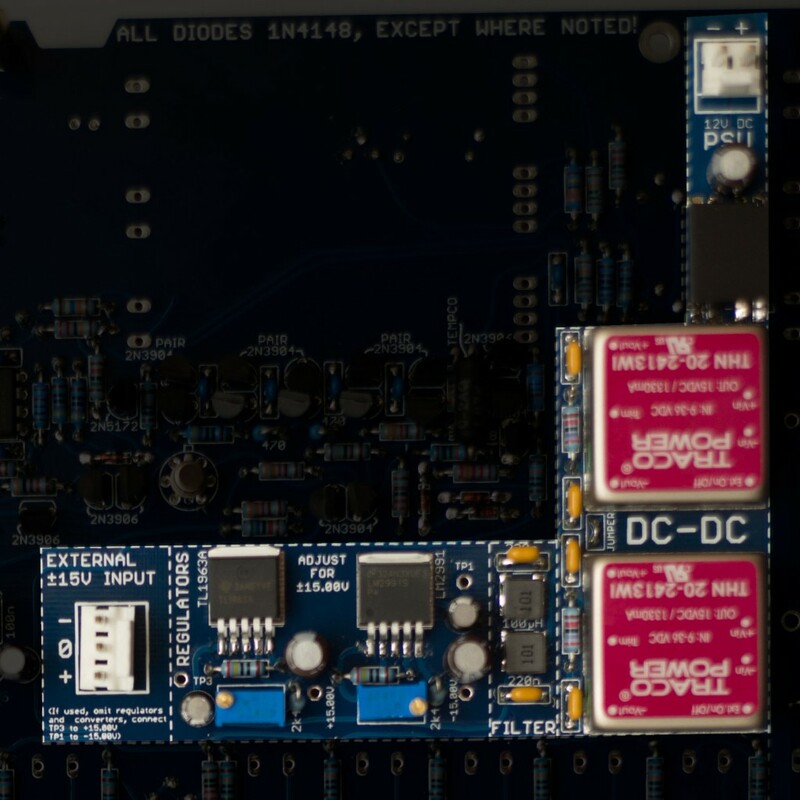 Depending on which DC-DC converter you’ve picked you might need a larger or smaller DC adapter (aka wallwart). Traco Power has run fine on 12V 1.5A adapter, but Murata has required a 20-24V adapter. If you’re experiencing hiccups when starting the complete synth there is a extra circuit that delays the LEDs to avoid this. Please see the finishing up section about this. And with this we’re done with the preparations and building of the PSU.